In the financial services industry, there may still exist some belief that wealthy women prefer to work with female advisors. There may be some belief that wealthy women prefer to work with male advisors. But the truth is that wealthy women care about many other traits assigned to financial advisors but do not care about the gender of the person they are working with. And some wealthy women really don’t care. Spectrem’s exhaustive study on wealthy women indicates that gender is not a consideration when financially successful women look to find a new financial advisor. The women surveyed for Successfully Growing Your Business with Wealthy Women were asked to place the importance of advisor traits on a 0-to-100 scale. For comparison, the most popular trait was “reputation based on referrals from trusted associates” which was placed at 78.38 on average. Millennials and Gen X women placed reputation at 81.18, and among those Ultra High Net Worth women with a net worth above $5 million, reputation was scored at 83.27. And where was gender rated? Overall, it got a rating of 23.36, the lowest mark of any of the five traits considered. There was virtually no segment of the wealthy women population who gave gender any kind of nod, including the World War II era investors, who scored gender at an even lower 22.10. For example, wealthy women who identify as Senior Corporate Executives scored gender at 18.90, and Business Owners went even lower, at 16.50. Managers went lower still, at 16.36. The highest rating for gender came from those women who never married, placing their average at 34.32. What is unknown is whether they prefer male or female advisors. Other than reputation, what else matters to wealthy women when choosing a new advisor? The company they work for was rated at 72.20, with a higher mark from the World War II investors and the UHNW women. An interesting result came when asked about the age of the advisor, which investors placed their rating at 48.54. Again, it is unknown how age plays a role, but earlier Spectrem research shows that young investors do have a tendency to prefer older and presumably wiser advisors. 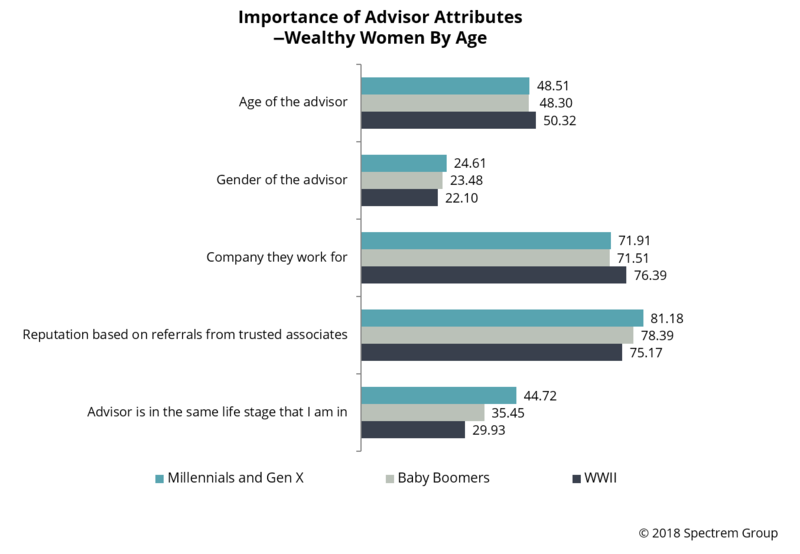 The women were also offered “advisor is in the same stage of life I am in”, which is not directly related to age but does indicate someone who might want to work with an advisor who is near their own age or in their own generation. That was rated at 35.91 overall, but climbed to 44.72 among Millennials and Gen Xers and 45.00 among the never married women. Thirty-one percent of wealthy women do not have a primary financial advisor, and more than half of those say they can do a better job of investing than a professional. Sexism is a hard topic to avoid. Is it sexist to offer a new female client a female advisor to work with? Is it sexist to assume females would like to work with a male advisor? The Spectrem study shows that it does not matter to the investor if the investor is a woman. They just want an advisor who is reputable. Advisory firms certainly have methods to determine the best investor-advisor fit, but the Spectrem research indicates gender-based selection is not necessarily applicable.